IEC 60320 C14 to IEC 60320 C13 10 amps 250 volts Power Cords. This C13 C14 power cord is commonly used to connect from a PDU (Power Distribution Unit) to a Server/Networking device. 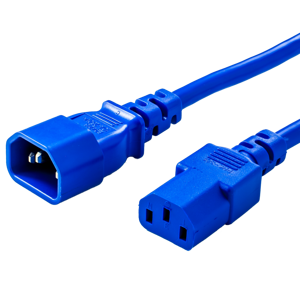 We offer a variety of colors, data centers typically choose a RED power cord for the primary power supply and a BLUE Power cord for the secondary power supply. This allows for easy identification of the primary and secondary power sources and reduces server downtime by decreasing accidental power failure. We stock standard lengths from 1' to 50'. Cordage is 18awg SJT (in some cases the jacket may be SJTO, SJTOW, SJTOOW or other). Black C14 to C13 10 amps 250 volts (C13 C14 10A 208V) Power Supply Cords according to IEC 60320 (IEC320). SJT(OW) and 18awg-3c. Use color cords for color coding your installation. Use RIGHT LENGTH cords to minimze power loss, maximize savings, and maximize the efficiency of your installation. The Blue 10A C13 (Connector) to the C14 (Plug) is widely used in data center applications (as well as others) to connect a PDU to a Server. Oftentimes, the colored varieties of the standard C13 C14 are used to differentiate primary and secondary power supply chains, to allow for fast identification when an alert has been generated. Using SJT Cordage, the standard 10 Amp C13 C14 is thicker than it's SVT counterpart. We thoroughly test all of the cords we sell, so you can be sure you are buying only the highest quality power cord on the market. Contact us if your are looking for a custom configuration or length, as we can provide the length and configuration to fit your specific requirements. The Gray 10A C13 (Connector) to the C14 (Plug) is widely used in data center applications (as well as others) to connect a PDU to a Server. Oftentimes, the colored varieties of the standard C13 C14 are used to differentiate primary and secondary power supply chains, to allow for fast identification when an alert has been generated. Using SJT Cordage, the standard 10 Amp C13 C14 is thicker than it's SVT counterpart. We thoroughly test all of the cords we sell, so you can be sure you are buying only the highest quality power cord on the market. Contact us if your are looking for a custom configuration or length, as we can provide the length and configuration to fit your specific requirements. 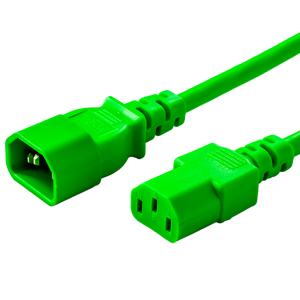 The Green 10A C13 (Connector) to the C14 (Plug) is widely used in data center applications (as well as others) to connect a PDU to a Server. Oftentimes, the colored varieties of the standard C13 C14 are used to differentiate primary and secondary power supply chains, to allow for fast identification when an alert has been generated. Using SJT Cordage, the standard 10 Amp C13 C14 is thicker than it's SVT counterpart. We thoroughly test all of the cords we sell, so you can be sure you are buying only the highest quality power cord on the market. Contact us if your are looking for a custom configuration or length, as we can provide the length and configuration to fit your specific requirements. The Orange 10A C13 (Connector) to the C14 (Plug) is widely used in data center applications (as well as others) to connect a PDU to a Server. Oftentimes, the colored varieties of the standard C13 C14 are used to differentiate primary and secondary power supply chains, to allow for fast identification when an alert has been generated. Using SJT Cordage, the standard 10 Amp C13 C14 is thicker than it's SVT counterpart. We thoroughly test all of the cords we sell, so you can be sure you are buying only the highest quality power cord on the market. Contact us if your are looking for a custom configuration or length, as we can provide the length and configuration to fit your specific requirements. The Pink 10A C13 (Connector) to the C14 (Plug) is widely used in data center applications (as well as others) to connect a PDU to a Server. Oftentimes, the colored varieties of the standard C13 C14 are used to differentiate primary and secondary power supply chains, to allow for fast identification when an alert has been generated. Using SJT Cordage, the standard 10 Amp C13 C14 is thicker than it's SVT counterpart. We thoroughly test all of the cords we sell, so you can be sure you are buying only the highest quality power cord on the market. Contact us if your are looking for a custom configuration or length, as we can provide the length and configuration to fit your specific requirements. The Purple 10A C13 (Connector) to the C14 (Plug) is widely used in data center applications (as well as others) to connect a PDU to a Server. Oftentimes, the colored varieties of the standard C13 C14 are used to differentiate primary and secondary power supply chains, to allow for fast identification when an alert has been generated. Using SJT Cordage, the standard 10 Amp C13 C14 is thicker than it's SVT counterpart. We thoroughly test all of the cords we sell, so you can be sure you are buying only the highest quality power cord on the market. Contact us if your are looking for a custom configuration or length, as we can provide the length and configuration to fit your specific requirements. 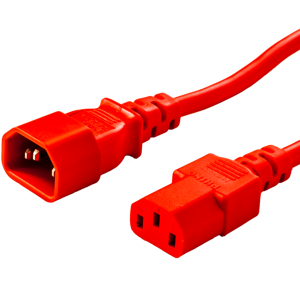 The Red 10A C13 (Connector) to the C14 (Plug) is widely used in data center applications (as well as others) to connect a PDU to a Server. Oftentimes, the colored varieties of the standard C13 C14 are used to differentiate primary and secondary power supply chains, to allow for fast identification when an alert has been generated. Using SJT Cordage, the standard 10 Amp C13 C14 is thicker than it's SVT counterpart. We thoroughly test all of the cords we sell, so you can be sure you are buying only the highest quality power cord on the market. Contact us if your are looking for a custom configuration or length, as we can provide the length and configuration to fit your specific requirements. The White 10A C13 (Connector) to the C14 (Plug) is widely used in data center applications (as well as others) to connect a PDU to a Server. Oftentimes, the colored varieties of the standard C13 C14 are used to differentiate primary and secondary power supply chains, to allow for fast identification when an alert has been generated. Using SJT Cordage, the standard 10 Amp C13 C14 is thicker than it's SVT counterpart. We thoroughly test all of the cords we sell, so you can be sure you are buying only the highest quality power cord on the market. Contact us if your are looking for a custom configuration or length, as we can provide the length and configuration to fit your specific requirements. The Yellow 10A C13 (Connector) to the C14 (Plug) is widely used in data center applications (as well as others) to connect a PDU to a Server. Oftentimes, the colored varieties of the standard C13 C14 are used to differentiate primary and secondary power supply chains, to allow for fast identification when an alert has been generated. Using SJT Cordage, the standard 10 Amp C13 C14 is thicker than it's SVT counterpart. We thoroughly test all of the cords we sell, so you can be sure you are buying only the highest quality power cord on the market. Contact us if your are looking for a custom configuration or length, as we can provide the length and configuration to fit your specific requirements. These cords feature 3 18awg conductors with North American Color Coding surrounded by a robust SJT (Service Junior Thermoplastic) outer jacket. These cord sets can be used in either 125V circuits, or, 250V circuits as shown on the left. When used in 125V circuits, there is one Hot conductor, the green Ground conductor, and one Neutral conductor. When used in 250V circuits, there are two Hot conductors, and the green Ground conductor. It is very important that you ensure the device you are plugging this cordset into can handle the voltage supplied by the power source. For example, if you connect this power cord set to a device rated for 125V, and a power source rated for 250V, you are going to fry the device as this cord set DOES NOT CHANGE VOLTAGE. Not what you are looking for? Please see below for alternative and similar options to our 10A C14 to C13 cord sets. Looking for Angled C14 to C13 Cords? 13A C14 to C13 Power Cord Sets - 13A C14 to C13 cord sets use 16awg SJT cordage. 15A C14 to C13 Power Cord Sets - 15A C14 to C13 cord sets use 14awg SJT cordage. C20 to C13 Power Cord Sets - C20 to C13 cord sets are used to connect a C19 outlet to a C14 inlet. C14 to C15 (similar to C13 but with a notch) Power Cord Sets - C14 to C15 cord sets are similar to a C14-C13 cord sets, differing only with a notch on the C15. These are available in 10A, 13A, or 15A configurations. C14 to C19 Power Cord Sets - C14 to C19 cord sets are used to connect a C13 outlet to a C20 inlet. Rated at 15A with 14awg cordage. C14 to C21 Power Cord Sets - C14 to C21 cord sets are used to connect a C13 outlet to a C22 inlet. Rated at 15A with 14awg cordage. 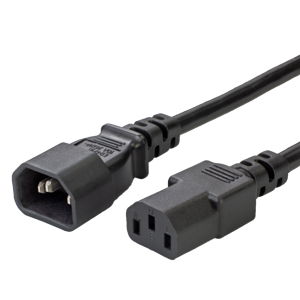 C14 to NEM 5-15R Power Cord Sets - C13 to NEMA 5-15R cord sets are used as an adapter to convert a C13 outlet to a NEMA 5-15R outlet.